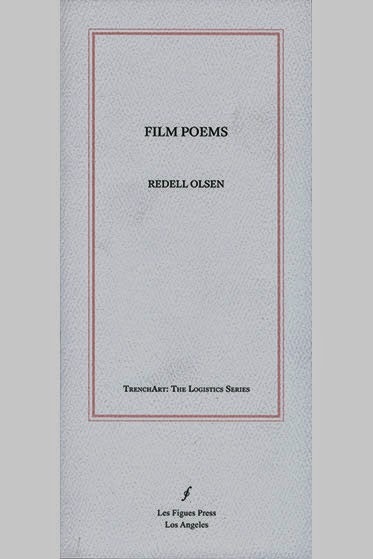 A stillness pervades Film Poems, the new collection of five chapbooks by Redell Olsen. The book dramatizes a kind of celestial mechanics of the spirit, and the concepts have been incorporated into a complexity that preceded them, so that they counterbalance each other, as energies whose rapport had gone unperceived until they were equalized – and yet they were interdependent all along, and therefore they remain at liberty. This collection assumes a prominent place amid an oeuvre that’s characterized by a rigorous, speculative intellectualism and an open inquiry into diverse issues related to the arts in general and to poetry in particular. Instead of commenting on Film Poems alone, it might be appropriate to coordinate this book with its author’s critical and theoretical writings, to read all of them together, and to offer an assessment of the unity that they present – bearing in mind that a reviewer’s job is to read an author’s works by their own lights as much as possible, and to judge them by their own standard, as far as that can be discerned. This nuanced viewpoint gives the lie to the presumption that the terms “radical” and “conservative” denote anything in art like the attitudes they are made to indicate in social life. What’s more, the passage makes a convincing case for traditionalism by contrasting it with other ways of writing. Where Martin uses hand-drawn lines to complicate the abstract regularity of the grid’s form, Howe uses the indeterminacies, associative meanings, and acoustical repetitions of language to complicate the clear and abstract representation of historical events and in doing so redraws the assumed maps and borders of the conceptual tracts she inhabits. Like Smithson’s maps of non-sites, [Bernadette] Mayer’s, [Fiona] Templeton’s and [Carla] Harryman’s writing calls the apparent singularity of the term site-specific into question. Their writing opens up a dialogic relationship between the material properties of site and the language itself. This place of exchange and translation functions as a space in which to figure alternative forms of subjectivity and agency in response to site as a broader category of cultural and social definition. The reader may well feel that Olsen’s “vast field of shared consciousness” is more like it – the cramped passage abruptly giving onto a bounded vista of scaled prospects. I think that using such a range of source material does place you beside oneself. A writing that is already half someone else’s or that quite obviously belongs elsewhere seems to me to offer quite an interesting position from which to begin an investigation, to acknowledge those previous contexts and see where it leads [….] I find that a fascinating aspect of [Susan Howe’s] writing; the way in which she is able to represent these voices and people apparently lost to history without pretending to speak through them in some kind of fictionalised construction. Despite its generalized view of the conventions of fiction as mere pretense, this skeptical stance is modest in that it approaches the central questions of the human condition with a sense of words as common property, and because its purposive indirection offers the reader a cogent space that isn’t over-determined. Not the poem as idea as idea but ideas in words as words. Not that the poem does not think that words are not made of materials. Not the dematerialization of the poem but the intermittent re-materialization of the word as object. Not an assumption of language as transparent but an exploration of its densities. Again, an appreciation of genre is apparent in this exercise, a scholastic approach that entails a projection outward and into (or perhaps an immersion under and in) a heretofore un-studied corpus or aggregation of data which must then be shown forth as self-sufficient, existing for its own sake by virtue of its own activity. I drew a plan of the writing instrument as a poetics as a film for showing in live performance as a writing of day for night. Situations in which I might be expected to film writing occurred and I was drawn to the archives and made them in the everyday. Here, consistent with certain peculiarly artistic means of regarding the self as if from outside its concerns, the author’s daily life turns into a kind of micro-situationist performance art piece, played out indefinitely in the service of a writing project, with or without onlookers. Living to write, and regarding the self as subject matter for use in art, this poet has meanwhile taken considerable trouble to inform the reader as to how the work in Film Poems came to be made. Just as really “seeing” a film is to experience our own vision—the technology that is always mediating our sight—really “reading” (a particular form of seeing) is to experience our own language as a constantly shifting medium; meanings emerge through ceaseless splicings and cuts. The ideas hang together as a cluster, each separate part suspended among the rest, arranged just so. It all depends upon what we understand by its terms. First, vision, whose vernacular meanings include the physical (as in “When he stepped outside, the sudden glare impaired his vision for a few seconds, rendering him unsure of where he was”) and the psychic (as in “She had a vision in which a woman descended through the air before her, stepped down onto the earth, and began to speak”). Further, making reference to the concept of vision by using the phrase “our own” often normally signals a notion that’s considered sacrosanct: everyone, it’s thought, has his or her own artistic vision, and supposedly a person can only know or understand or experience his or her own vision, never someone else’s. Second, language,whose meanings range from the biological (as in “Humans communicate using facial expressions and nonverbal gestures, as well as spoken and written language”) to the cultural (as in “She informed him that there was a lot more to her country’s language than just High German”) to the idiolectic (as in “Who can forget having been told as a child: ‘Watch your language’?”). Without any indication that the phrase “our own vision” is or ought to denote something natural or personal, the above statement describes our own vision as a kind of technology, not in the current popular senses of “advanced industrial manufacture” or “handheld gadgetry,” but rather as a kind of ethereal machinery that runs interference between ourselves and the optical equipment responsible for our physical sense of sight: that is, between us and what we see. Likewise, in the above statement, language, far from indicating a biological or national or cultural or individual acquisition or tool, means a kind of technology that similarly runs between us and what we say – and that therefore comprehends and incorporates those other sorts of language too. Finally, both of these technologies is a medium in that each of them carries things to and fro as a conveyance, and intercedes as a go-between. For Olsen, it’s these media alone – and not The Self or The Other or The World – that we experience when we read a book or see a film. It is from the medium itself that our emotions are born as we see and read. And a medium, again, is common property, as it were – albeit “constantly shifting” – because we all have a stake in it: all of us are forever creating and using it. In the jargon of filmmaking, a cut is the change from one image to another that’s created by a splice, the physical jointure between two lengths of celluloid. But the word splicing, used as a noun – as in “a splicing” – is a piece of poetic diction which is intended to signal the action of joining the pieces of film together. “Ceaseless splicings and cuts” therefore invokes the profoundly moving experience one sometimes has while watching a film or reading a text, in which there is a powerful sense of another person “on the other side” of the artwork, who is in the act of creating it, even in the very moment one watches or reads. Further, to claim – as Olsen’s statement does – that reading is “a particular form of seeing” is to make an argument for a special sense of reading as a subfield of physical sight. This may strike the critical reader as a rather severe limitation upon the possibilities of the medium of writing, undue because self-imposed; it seems likely that this excusable inaccuracy comes (along with much that is beneficial) from Susan Howe’s apparently formative influence upon this poet. Finally, the claim that there are such things as “really seeing’” and “really ‘reading’” suggests that degrees of acquisitive and generous participatory activity will reward us in proportion as we devote ourselves to them and lose ourselves in them, and that this selflessness of ours lets meanings emerge. London Land Marks (2007) refers to a 1950’s 8mm black and white ciné film entitled “London Landmarks” probably produced for tourists visiting London. The film caught fire the first time it was put through the projector. What remained of the pieces of film reel were scanned onto a computer and provided a series of still images that were projected alongside the poem during readings. These stills often contained multiple frames, as well as the edges of the original film stock which had words and letters already printed on them. The original film included pictures of famous landmarks in London such as Tower Bridge, Trafalgar Square and Buckingham Palace and more incidental images of a woman feeding pigeons, a London bus and the crowds on Oxford Street. One section of the still recovered in the scanning process showed a hand setting up a poster that detailed suggested topics for speeches that were to take place at Speaker’s Corner in Hyde Park; a place in which open-air speaking, debate and discussion are allowed apparently on any subject as long as the police consider the speeches lawful. In 2003 the authorities tried unsuccessfully to ban a demonstration against the war in Iraq that was to take place in the park. Ominous and personable, generalizing and declarative, vernacular and unemphatic, Film Poems opens with a kind of civic area designated for public use. Because of the writing’s intent and measured concentration upon its subject matter, passages like this one strike the reader as the textual component of a quasi-claustral rite, reverberating someplace unseen, deep within cell walls, the hours of a strict cohort devoted to the gentle arts of peace, a song of deep meditation faintly overheard. Again, aside from the excellence of the evocation, there is a finesse of workmanship here, as the repeated words “you remember” occur where one might more or less comfortably say them. The fact that this stylistically post-Modern recollection comes not from the author’s own life, but from recorded testimony, marks a departure from – and an advance upon – established and recognized form; as such it also marks the triumph of Film Poems.